I love cooking and eating cod because it’s such a versatile, mild-flavoured fish, not to mention being crammed with all sorts of nutritional goodness. I grew up eating it coated in cracker crumbs and panfried; while I still enjoy fish fillets prepared that way, sometimes I just crave a little more flavour. This recipe delivers taste in a big way – and it takes less than 20 minutes to make! Crispy Panko and sweet pecans make a crunchy, delicate crust for cod fillets that have been dipped in egg and Dijon. Baked rather than fried, this is a tasty, healthy dish! Preheat oven to 425F. Place a large, heavy-duty, oven-safe skillet (cast iron is ideal) in the oven to get hot while oven preheats. Dry the cod fillets with paper towel and set aside. Combine the chopped pecans and panko in a pie plate or other shallow dish. In a second shallow dish, beat egg and Dijon together till smooth. Add about a half teaspoon (2.5 mL) of freshly ground black pepper and a quarter teaspoon (1.25 mL) of salt. Add the oil to the skillet to heat in the oven while you coat the fish. Dip the fillets in the egg mixture then dip them in pecan-panko mixture so both sides are well-coated. Place the coated fillets in the hot skillet and return it to the oven. After 5 minutes, carefully turn the fillets over. Cook another 5 – 7 minutes or until internal temperature of the thickest part of the fillets is 160F. While fish is cooking, make lemon-chive sauce. Melt butter over medium heat in a small saucepan. Add shallot and garlic and cook for 2 minutes, stirring occasionally. Add white wine and cook until reduced by half (about 2 minutes). Add cream, cornstarch mixture, lemon zest and juice. Cook 2 minutes. Add butter and chives, plus salt and pepper to taste. Keep warm on low heat. 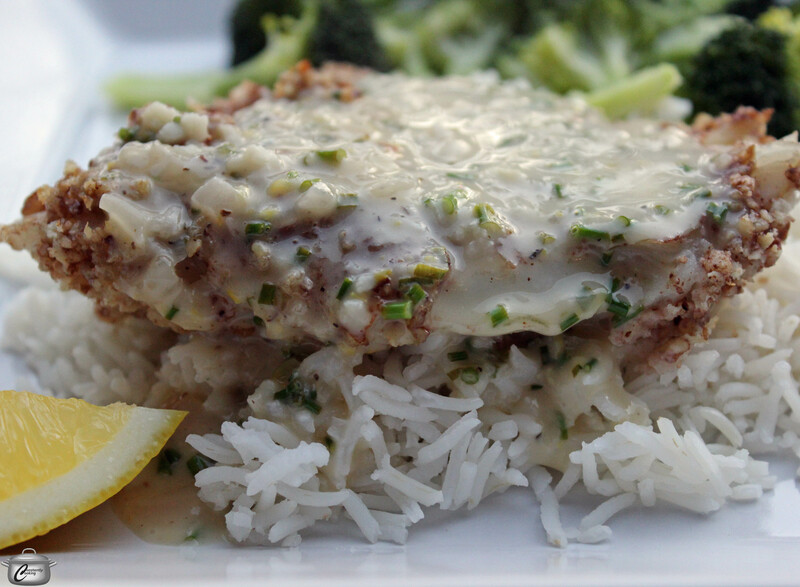 Once fillets are cooked and plated, top with a generous amount of lemon-chive sauce. This entry was posted in fish, Meat, Recipes and tagged baked, butter, chives, cod, cream, crust, easy, fast, fish, healthy, lemon, nutritious, panko, pecan, quick, sauce, Vitamin B, white wine. Bookmark the permalink. We made this and it was so good!